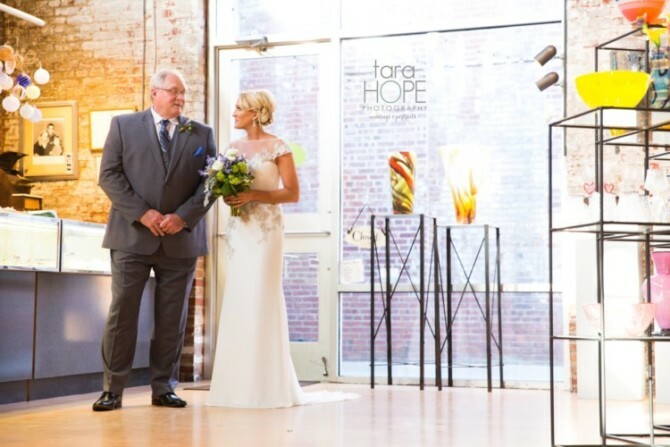 Today we are sharing Megan and Jason’s Corradetti Glass Studio wedding. We love working with all of our clients, but Megan and Jason are just that kind of couple that make your heart extra happy. We stumbled upon a photo of their Corradetti Glass Studio on their photographer’s, (the amazing Tara Hope Photography), Facebook page. Their wedding at the stunning Corradetti Glass Studio is one that is bursting with spring wedding inspiration. We have clients ask us all the time what color table linens we would recommend for events at Corradetti, and honestly Megan and Jason’s wedding colors are at the top of the list. Megan coordinated all of her wedding decor, and did an amazing job incorporating lavender in her centerpieces and flowers, which paired beautifully with the lilac colored napkins and accent table linens. There were so many personal wedding decorations like the guest books at each guest table. Table one’s guest book will be read by Megan and Jason on their First year wedding anniversary, table two will be read on their second year anniversary, and so on, for eight wonderful years! Plus, lottery scratch-offs with a lucky penny attached, adorable cake pop wedding favors made by a family member, and so much more. Megan and Jason’s wedding ceremony took place on a beautiful spring evening in April, in front of their closest family members and friends. After the ceremony, guests headed to Corradetti’s gallery that is full of blown glass artwork that is made on site. During cocktail hour, guests enjoyed the signature wedding drinks of Orange Crushes and Grapefruit Crushes. We also had a raw bar with oysters shucked on-site, which paired well with the craft Baltimore beers picked out by the bride and groom. Other delicious wedding appetizers included tomato soup shooters with grilled cheese, pulled pork sliders, miniature Chicken and Waffles with a maple thyme syrup, and buffalo chicken wontons with bleu cheese sauce. After cocktail hour, guests enjoyed a first course of baby spinach salad with red wine poached pear, bleu cheese crumble, candied walnuts with a house champagne vinaigrette. For the main course, guests had the option of beef tenderloin with a Cabernet sauce, seared rockfish topped with corn and tomato salsa, or a portobello mushroom stack drizzled with balsamic glaze. Both entrees were accompanied by smoked Gouda mashed potatoes and broccoli rabe sauteed with garlic and olive oil. For dessert, we made freshly baked cookies served with milk shooters. Guests also enjoyed the stunning four-tier wedding cake, which was provided by LaCakerie. Congratulations to Megan and Jason. It was such a pleasure getting to be a part of your amazing day! Error: Error validating access token: Session has expired on Friday, 12-Apr-19 20:42:14 PDT. The current time is Thursday, 18-Apr-19 05:37:40 PDT.